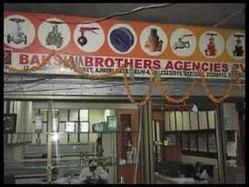 We, Bakshi Brothers, Delhi are engaged in Wholesaling and Trading of quality MS Pipes, MS Pipes Fitting, Gland Packing and Jointing, GI Pipes, Conveyor Spare Parts, Gate Valves, Globe Valves and much more. We have over the last decade widened our operations & established an impeccable reputation in the industry for excellence. This excellence is a consequence of hard work and creativity on part of our team of workers, researchers and managers. In an endeavor to provide the best products and services, we have associated ourselves with some of the most reputed names in the industry. Our efforts are aimed at providing products which guarantee customers the vital competitive edge in the market. With experience and expertise, we aim to expand our operations through strategic propositions and collaborations. Our great mentor Mr. Aman Bakshi (Director) has been driving the whole organization with his competent resource and management skills to achieve milestones in the business. As a globally acclaimed organization, we have instituted a policy that has stringent guidelines for quality in our entire range of products and services. From raw materials to packaging, every facet of our operations is overlooked by a team of experts for adherence to our quality standards. Rigorous testing using cutting-edge testing machinery is a hallmark of our quality assurance program. This dedicated approach to quality has established an emphasis on excellence that encompasses every aspect of our business. We have a separate R&D department, which has helped us to mark a distinction in this competitive market. Our efficient R&D personnel conduct extensive researches that have helped us to improve the quality and performance of our HDPE and PVC pipes, Valves and fittings. The R&D team incorporates new ideas and innovations with respect to the present resources of the company. Our product range is tested throughout the production process, which assures better quality products to our clients. We have earned extensive recognition in the markets and built cordial relations with numerous clients, due to our authentication in business activities. We have over the years served customers across diverse industries with our world-class piping products and services. This has enriched our expertise and today, we have the capability to deliver solutions for every demanding application need of our clients. Innovation in products & processes are the hallmarks of our business operations. Improvement at Hydro-flex is a sustained process, and we consistently work towards enhancing the quality of our products to meet the growing demands of our customers around the world.